Venezuelans protested at the Red Cross headquarters in Caracas on Monday accusing the government of selling some of the organization’s recently arrived humanitarian aid. 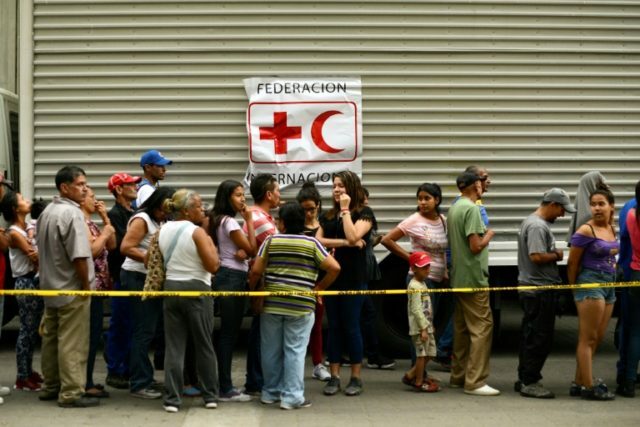 The Red Cross made its first delivery of emergency aid to the country last week after the Maduro regime finally caved in to international pressure and accepted aid. The regime had previously denied the existence of any humanitarian crisis and rejected offers of food and medicine. There are already signs the socialist regime has meddled with the aid’s distribution, leading many to believe they have sold it for a profit. The second round of humanitarian aid is expected to arrive on May 8, which includes surgical equipment they hope will be able to benefit around 650,000 Venezuelans. President Trump in a tweet Wednesday morning accused Mexican soldiers involved in a recent confrontation with U.S. troops along the border of aiding drug cartels. “Mexico’s Soldiers recently pulled guns on our National Guard Soldiers, probably as a diversionary tactic for drug smugglers on the Border. Better not happen again!” Trump warned. “We are now sending ARMED SOLDIERS to the Border. Mexico is not doing nearly enough in apprehending & returning!” he continued. His tweet came hours after it was reported that two U.S. soldiers were stopped earlier this month by Mexican soldiers who thought they had crossed the border in a remote part of Texas, south of the local border wall section but north of the actual physical border. The Associated Press reported Tuesday that Mexican troops departed after a brief conversation with the U.S. forces, and a subsequent inquiry by Customs and Border Protection (CBP) found that the Mexican soldiers believed themselves to be on home territory when the confrontation occurred. During the incident, a Mexican soldier reportedly confiscated a service pistol from one of the U.S. troops, depositing it inside one of the U.S. vehicles. The U.S. Navy is drafting new guidelines for pilots and other personnel to report encounters with “unidentified aircraft,” a significant new step in creating a formal process to collect and analyze the unexplained sightings — and destigmatize them. The previously unreported move is in response to a series of sightings of unknown, highly advanced aircraft intruding on Navy strike groups and other sensitive military formations and facilities, the service says. “There have been a number of reports of unauthorized and/or unidentified aircraft entering various military-controlled ranges and designated air space in recent years,” the Navy said in a statement in response to questions from POLITICO. “For safety and security concerns, the Navy and the [U.S. Air Force] takes these reports very seriously and investigates each and every report. To be clear, the Navy isn’t endorsing the idea that its sailors have encountered alien spacecraft. But it is acknowledging there have been enough strange aerial sightings by credible and highly trained military personnel that they need to be recorded in the official record and studied — rather than dismissed as some kooky phenomena from the realm of science-fiction. The development comes amid growing interest from members of Congress following revelations by POLITICO and the New York Times in late 2017 that the Pentagon established a dedicated office inside the Defense Intelligence Agency to study UAPs at the urging of several senators who secretly set aside appropriations for the effort. The John C. Stennis and Abraham Lincoln carrier strike groups have joined the US Mediterranean 6th Fleet for the first time in more than two years. This was announced on Monday, April 22, by the 6th Fleet commander, Vice Adm Lisa Franchetti. DEBKAfile’s military sources add that this unusual concentration of US naval and air might in the region is intended to convey a warning to Iran against striking back at the US or its allies in the region in retribution for tightened Trump administration sanctions on its oil experts. This level of concentrated strength is capable of countering any Iranian attempt to interfere with the oil tanker shipping plying routes to market from the Gulf through the Strait of Hormuz, the Gulf of Aden or the Red Sea. See DEBKAfile’s earlier special report. A region of South America with a seemingly bleak future heard the hope-filled message of Christ last week. More than 94,000 citizens of Colombia and Venezuela attended Franklin Graham’s Festival of Hope and an additional 22,000 an accompanying kid-friendly event Thursday through Saturday in Cucuta, Colombia, which is situated on the Colombia-Venezuela border. The city has absorbed a mass exodus of Venezuelans in recent years as that country has faced an economic crisis and a food shortage. Pope Francis said Sunday that homosexual tendencies are not sins, and that parents who are concerned about tendencies in their children should take them for psychological assessment before jumping to conclusions. Barack Obama and Hillary Clinton are facing criticism after calling Christians who were killed on Easter Sunday in Sri Lanka “Easter worshippers” on their Twitter accounts. “The attacks on tourists and Easter worshippers in Sri Lanka are an attack on humanity. On a day devoted to love, redemption, and renewal, we pray for the victims and stand with the people of Sri Lanka,” Obama tweeted. 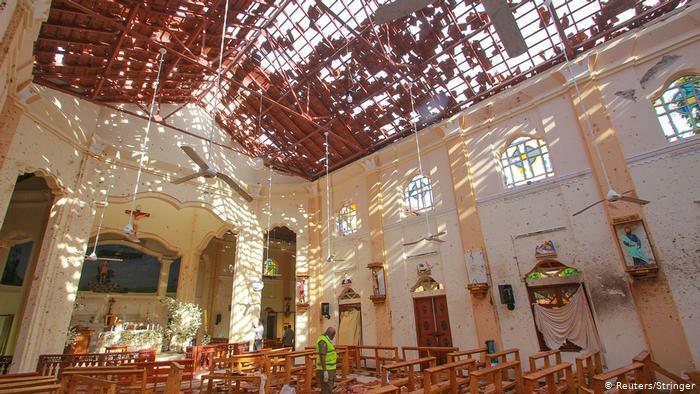 The U.N. Human Rights Council (HRC) has not condemned or otherwise reacted to the suicide bombings targeting churches and hotels in Sri Lanka on Easter Sunday, the most important day of the Christian calendar. German lawmakers across the spectrum on Tuesday called for stronger protections of Christian minorities worldwide following the coordinated attacks at several Sri Lanka churches and hotels on Sunday which killed over 300 people, according to Deutsche Welle. Members of German Chancellor Angela Merkel’s conservative Christian Democratic Union (CDU), the liberal Free Democrats (FDP) and Greens all expressed their concern about what they saw as growing violence against Christians. Earlier this month, it was an incredible sight to see: a Russian Tu-154M-ON (NATO reporting name: “Careless”) reconnaissance plane conducting a surveillance mission over US sensitive military sites — places where even US commercial jets are generally forbidden to fly over, we reported. A new report Monday from Krasnaya Zvezda (Red Star), translated and reported by Sputnik, said that another Russian military reconnaissance plane will fly over US territory April 22-27. 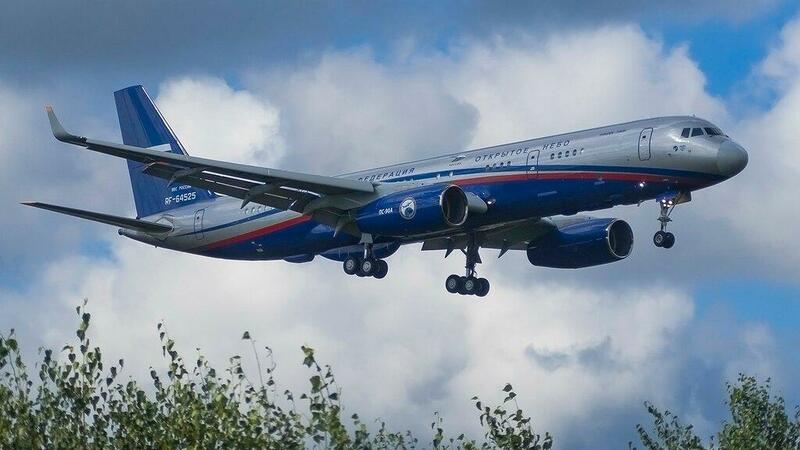 The Russians will use a Tupolev Tu-214 for the second surveillance mission carried out within the guidelines of the international Treaty on Open Skies, Red Star said, citing Ministry of Defence of the Russian Federation Sergei Ryzhkov. Online flight tracking software provided by Flightrader24, shows the Tu-214, with the registration number RF-64525, and using an Open Skies call sign, OSY332T, landed in Reykjavik, Iceland on Monday morning. The aircraft took off around noon to continue its journey to the US. The plane is expected to conduct the reconnaissance mission from Rosecrans Air National Guard Base, in Buchanan County, Missouri this week.